Cortona, Italy is a Tuscan town of Etruscan origin that spreads up the steep slopes of a hill rising from the Val di Chiana. Indeed, it was one of the Etruscan Dodecapoli (league of twelve cities). Cortona is surrounded by defensive walls, the foundations of which date back to the Etruscan period and are easily recognised as such by their "cyclopian" construction, so different from the regular rows of large squared blocks laid down in Roman times and smaller ones from the mediaeval period. Tightly-clustered mediaeval houses pack the slopes, leading upwards to an open green area in the middle of which is the huge Medici fortress (the Fortezza Medicea). 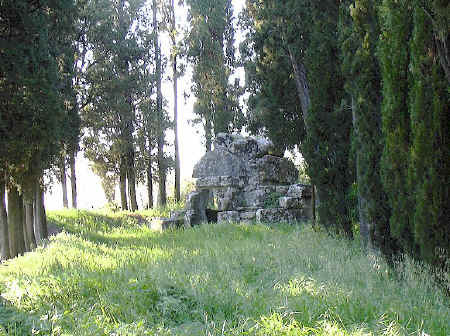 The road to Cortona from the valley starts near the Melone Etruscan tombs. On the way up the hill the road passes more Etruscan tombs, olive groves and the Renaissance Church of Santa Maria delle Grazie al Calcinaio. Those arriving by bus alight in Piazza Garibaldi from which there is a splendid view out over the Valdichiana. 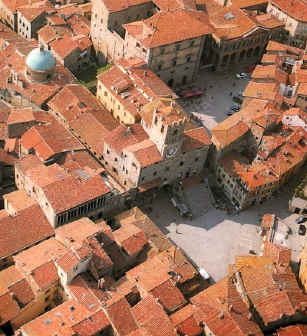 From the square, visitors walk along Via Nazionale, Cortona's only horizontal street, to the Piazza Repubblica and the Piazza Signorelli which form the centre of Cortona, Italy. Tanella o Grotta di Pitagora - the "Tomb of Pythagoras"
The so-called Cave, Den or Grotto of Pythagoras is one of the more famous of the Etruscan tombs on the outskirts of Cortona, Italy. (It has no connection with Pythagoras.) It dates from the fourth century B.C. and was already known in the 1500's and when it was visited by Vasari. The earth tumulus that covered the tomb is long gone, leaving an arched structure and the cruciform tomb chamber which measures 2 m by 2.5 m and was enclosed by large wedge-shaped blocks. The approach is along an avenue of cypresses which adds to the pleasing ambience of the location. Cortona is justly famous for its panoramic views out over the Val di Chiana with Lake Trasimeno in the distance. In fact, the views are one of the reasons to make the climb up to the Fortezza Medicea at the summit of the spur on which Cortona is located. The present-day appearance of the Val di Chiana is the result of marsh drainage and reclamation work that was started by the Romans and carried on right through to the 20 C, although drainage of the malarial wetlands was largely completed by 1840. Leonardo da Vinci drew a map of the area at the beginning of the 16 C, that shows the valley occupied by a large lake running north-south. It is now a verdant plain extending all the way to Lake Trasimeno. Cortona offers an excellent monthly antiques and collectables fair and an annual antiques exhibition. The monthly antiques and bric-a-brac market takes place on the third Sunday of the month in Piazza Signorelli. The Cortonantiquaria, the Cortona Antiques Exhibition, is held annually in the 18 C salons of the Palazzo Vagnotti and the Palazzo Casali from the last Saturday in August to the second Sunday in September. This is one of Tuscany's biggest antiques fairs, attracting around 50 exhibitors from all over Italy. It was initiated in 1963 to promote Cortona’s flourishing restoration and furniture reproduction business. The Cortonantiquaria was primarily dedicated to the “mobile antico” (antique furniture) but over the years it has been enlarged to include art, jewellery and other antiques. 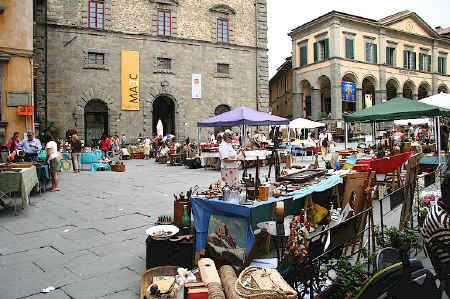 A huge antiques fair is held on the first Sunday of the month and the preceding Saturday in nearby Arezzo. Over 500 dealers usually show up offering a vast range of collectables for sale. This is probably the largest fair of its kind in Italy. Cortona Italy © ammonet InfoTech 2009 - 2018. All rights reserved.